When I was a little kid we spent a lot of time in France during our Summer holidays. This was in the 1970’s and food at this time in France tasted very different to food we were given at home in England. For a start the milk in France at that time had a very odd flavour that we didn’t like it at all. I think it must have been something to do with how they pasteurised their milk, because years later when we spent our summers in France with our own kids the milk tasted fine. The plus side of French food was that we would get to eat fresh baguette, warm from the boulangerie with unsalted butter. It seems funny to think that unsalted butter was such a novelty to us, but it was. These were simple pleasures, and the combination of the creamy unsalted butter and warm fresh bread was divine. The other thing we found incredibly exciting was the discovery of Nutella. It was a huge treat, almost as good as Butterscotch Angel Delight. Amazingly, Nutella was something which was not available in London at that time, (my son refers to this as the olden days, much to my annoyance). For us, Nutella was a seasonal summer time treat that you could only buy in France. If you read the ingredients you’ll see that Nutella is packed with sugar and palm oil. In our house it has been a very occasional guilty treat. I felt a bit mean completely banning something which was so exciting to me as a kid, but luckily for me my son didn’t really like it when he was very little. Recently though he has been pestering me to buy it for him more and more, that was, until this last summer. While we were on holiday with my friends daughter she said something that really resonated with him. All my nagging about the unhealthy sugar in it had gone over his head, but when she told him that Nutella, and the palm oil it contained was having a devastating effect on the Orang-utangs environment he really listened. She explained that the problem was the forests where the Oran-utangs lived were being burnt down to make way for the increasing demand for Palm Oil. This was endangering their environment and was responsible for their deaths and their declining population. Sadly this ingredient is in many shop bought products, both healthy and unhealthy. So with this in mind I made an alternative. It doesn’t taste exactly like the real thing but at least it’s less destructive both to him and the environment. With thanks, I dedicate this recipe and post to the Orang-utans and to dear Lily-pad who for the first time has made my son conscious of some of the food choices he can make and that, in turn may actually make a difference in the wider world. 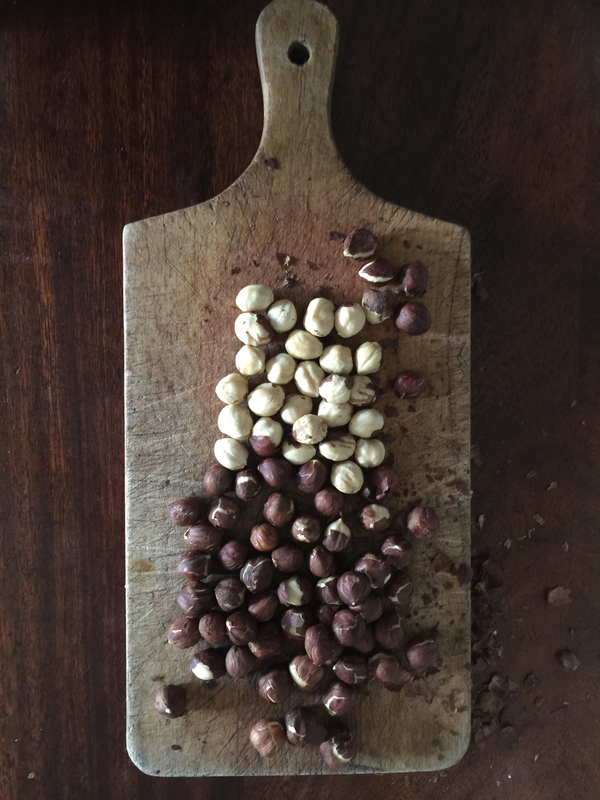 Bake hazelnuts for 8-10 minutes, until browned. Rub off as many of the skins as possible to prevent them being bitter. Grind the nuts in a food processor until they are like a smooth butter. Add the remaining ingredients and process until well mixed. Store in the fridge for several weeks in a glass jar. 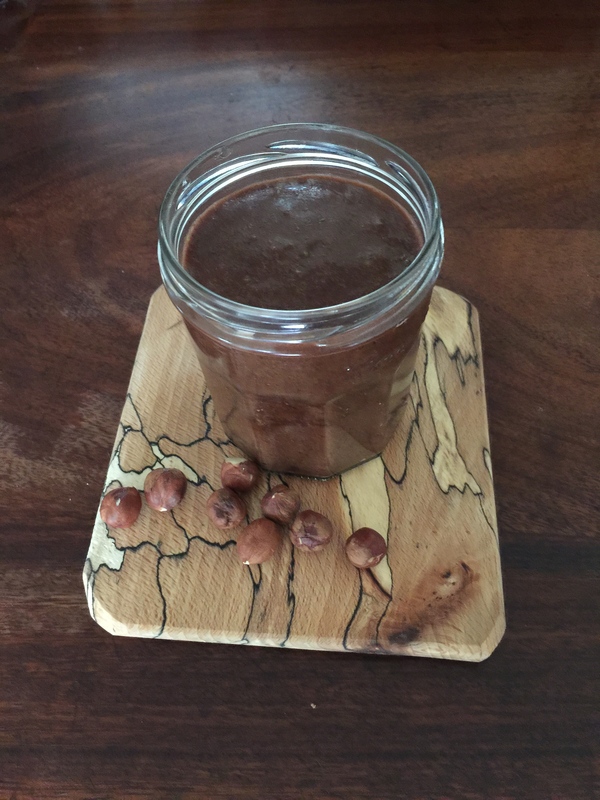 This entry was posted in Gluten Free, Recipes, Uncategorized and tagged chocolate, healthy, kids, nuts. Bookmark the permalink.